Remaining performances: March 2 at 2 p.m. March 5, 8 and 13 at 7:30 p.m. March 16 at 2 p.m.
Tickets: $19-$311. Student and senior rush tickets, subject to availability. Liam Bonner in the title role sings his final soliloquy in Los Angeles Opera’s production of Benjamin Britten’s “Billy Budd,” which opened last night at the Dorothy Chandler Pavilion. Photo by Robert Millard. Benjamin Britten’s opera Billy Budd can be approached from several — perhaps dozens of — perspectives: religious, political, sexual, etc. It has allusions to the operas of Verdi and Wagner who, like Britten, celebrated important birthdays last year (200 for the first two and 100 for Britten). But first and foremost, Billy Budd is a gripping drama with a marvelous musical score. Liam Bonner, who made his role debut last night, told me last week that he believed most people would come to the opera first through the drama and then through the music. Last night, in the first of six performances, Los Angeles Opera succeeded marvelously on both important points. I was on the edge of my seat right to the end and my wife stayed awake all evening — the highest of praise. Everyone involved — cast, orchestra and, in particular, the men of the LA Opera Chorus — sang, played and acted Britten’s music wonderfully. With this production, the company’s multi-year “Britten 100/LA” celebration is ending on an extremely high note. Britten wrote the original version of Billy Budd in 1951, using a libretto written by E.M Forester and Eric Crozier. In 1960, Britten revised the opera from four acts to two acts plus a prologue and an epilogue. This later version is now standard and is being used here. Billy Budd is unique in several ways. The cast of more than 20 and a chorus of 46 men and 10 boys (from the Los Angeles Children’s Chorus), plus 14 fighters and supernumeraries, are all men. In his typically erudite pre-performance lecture, Music Director James Conlon noted nobody had every done that in an opera before. The orchestra of more than 70 was the largest Britten ever used, including in Peter Grimes. 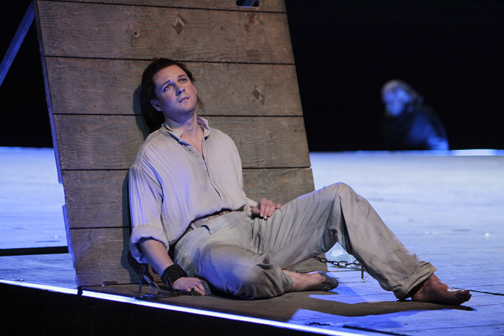 However, Billy Budd has similarities to Britten’s other two big operas: Peter Grimes and Death in Venice. Most apparent is the fact that all three operas use the sea as their locale. In the case of Billy Budd, that’s literally true because the entire opera takes place on an English warship, the HMS Indomitable, sailing the Atlantic in 1797 in search of the French. 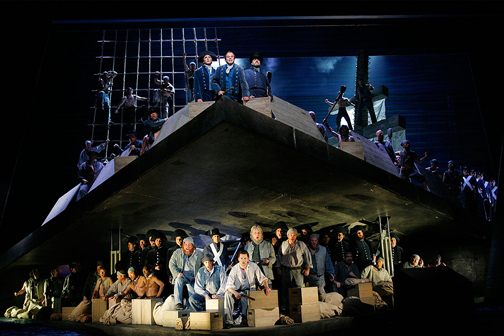 In Francesca Zambello’s spare but highly effective production — created in 1985 with sets and costumes by Alison Chitty and last seen in Los Angeles in 2000 — that ship is a large triangular plank that juts from the stage over the orchestra pit; part of the plank raises to form a battle station and the captain’s cabin. Ropes and a mast add verisimilitude to the atmosphere aided, particularly in the last scenes, by Allen Burnett’s lighting design. Director Julia Bevzner moved the action along smoothly. Bonner, a baritone from Pittsburgh, is creating the title role for the first time and last night the world discovered it’s next great Billy Budd. At age 32 (and seeming much younger) Bonner really looks the part of the sweet, innocent young man. But this was no one-dimensional performance. Bonner sang with impressive power and pathos throughout the evening, particularly in his final soliloquy in which he praises Captain Vere, the man who ultimately condemned him. Equally important, his acting was subtle and thoughtfully conceived from beginning to end, and he deserves special kudos for dangling quietly for 10 minutes following his hanging near the opera’s end. As Vere, veteran tenor Richard Croft (right) at times displayed the sort of gleaming voice Britten always favored in his tenors (particularly his life partner, Peter Pears) but in other scenes Croft’s voice turned appropriately steely. His anguish in the scene in which he must choose between enforcing the King’s strict justice over compassion for Billy Budd was heart-rending, as was his concluding epilogue. Greer Grimsley, making his LAO debut as the evil John Claggart, a Britten-esque Iago, brought Wagnerian fervor to the role. As usual LA Opera has assembled a very strong ensemble cast; that ability has been one of the company’s strengths during its recent run of Britten operas, including The Turn of the Screw and Albert Herring. Among the many cast members, special mention goes to James Creswell as Dansker, Keith Jameson as Novice and, in particular, Greg Fedderly as Red Whiskers. The men of the Los Angeles Opera Chorus, a vital part of the opera, acted and sang splendidly throughout the evening while successfully negotiating steep stairs and scrambling up and down ropes. Conlon has a deep and abiding love for Britten and that shows every time he steps into the pit for one of the composer’s operas. Last night was no different as Conlon and the orchestra played the score with equal portions of grandeur and grace. Never has a three-hour-long evening flown by so quickly. The crew prepares for battle aboard the HMS Indomitable in Francesca Zambello’s staging of Benjamin Britten’s “Billy Budd.” Photo by Robert Millard. 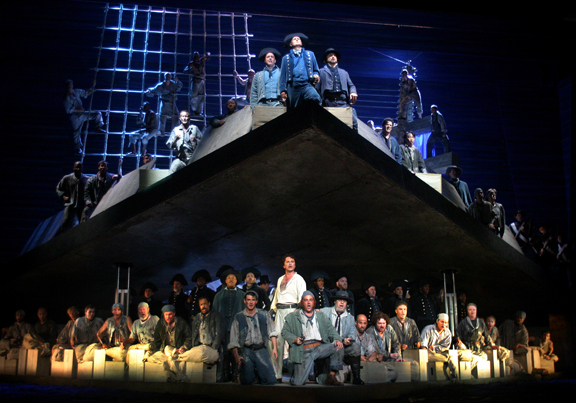 • LA Opera has a number of articles in the “Learn More” tab of the Billy Budd section of its Web site HERE. They and the synopsis provide good reading ahead of time, particularly if you’ve never seen the opera before. The opera portion of the printed program is also available for downloading. And, of course, don’t miss Conlon’s frenetic, pre-performance lecture. • The final performance of Billy Budd overlaps the beginning of Donizetti’s Lucia di Lammermoor, which opens on March 15 in a new production that stars Russian soprano Albina Shagimuratova in the title role. DETAILS. (c) Copyright 2014, Robert D. Thomas. All rights reserved. Portions may be quoted with attribution. A shorter version of this article was first published today in the above papers. Several significant events will take place during the next fortnight, headed by Los Angeles Opera’s revival of its production of Benjamin Britten’s Billy Budd, which opens next Saturday at 7:30 p.m. in the first of six performances running through March 16 at the Dorothy Chandler Pavilion. Four performances are in the evening while two are in the afternoon. LAO Music Director James Conlon will conduct this production and will offer one of his typically erudite lectures an hour before each performance. Billy Budd concludes the company’s celebration of the centennial of Britten’s birth on Nov. 22, 2013. Baritone Liam Bonner performs the title role for the first time, joining with tenor Richard Croft as Captain Vere and bass Greer Grimsley, making his company debut, as John Claggart, whose attraction to Billy is the pivot point of the opera. The production, by Francesca Zambello, originated in Geneva in 2004 and at London’s Royal Opera House, Covent Garden in 1995; it was first seen in L.A. in 2000. Read my preview story HERE. David Ng’s preview story in the Los Angeles Times is HERE. • The Los Angeles Chamber Orchestra presents its annual “Discover” concert at Ambassador Auditorium in Pasadena Saturday night at 8 p.m. The program this year focuses on Beethoven’s Symphony No. 3 (Eroica). In the first half of the program, Music Director Jeffrey Kahane will lead the orchestra in a demonstration and discuss this pivotal work in classical music history. The second half will be a complete performance of the symphony. • The Los Angeles Philharmonic begins its “TchaikovskyFest” series on Thursday night at Walt Disney Concert Hall with a performance by the Simón Bolivár Symphony Orchestra String Quartet and members of the Los Angeles Philharmonic. Beginning Friday and continuing every night (and some days) except one through March 2, Gustavo Dudamel will lead his two orchestras, the Phil and SBSO, in performances of all six of Tchaikovsky’s symphonies plus other assorted works. Mark Swed has an interview with Gustavo in the Los Angeles Times HERE. • Muse/ique continues its “Uncorked” series with a performance on Feb. 24 at “The Noise Within,” the theatre/performing space located just north of the Gold Line’s Sierra Madre Villa station at the eastern edge of Pasadena. Music Director Rachael Worby will lead 13 members of her ensemble in Aaron Copland’s original score for the ballet Appalachian Spring. However, in true Worby fashion, that’s just part of the evening. The 70-minute program will also feature Mike Simpson (aka EZ Mike of the Dust Brothers) and fits + starts for electronic music with live cello, a piece commissioned by L.A.’s Hysterica Dance Company from composer Anna Clyne. Kitty McNamee and members of Hysterica Dance Co. will supply choreography for the evening. 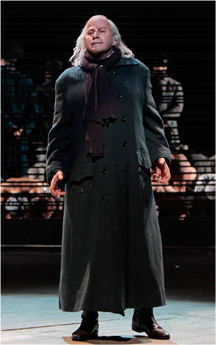 Feb. 22, March 5, 8 and 13 at 7:30 p.m. March 2 and 16 at 2 p.m.
LA Opera will use Francesca Zambello’s striking production when it presents Benjamin Britten’s Billy Budd beginning Saturday night at the Dorothy Chandler Pavilion. Photo from Washington National Opera. As the clock ticks toward next Saturday, anticipation is beginning to mount as Los Angeles Opera prepares to present Benjamin Britten’s Billy Budd, the climax of the company’s nearly two-year-long “Britten 100/LA” celebration of the centennial of composer’s birth on November 22, 2013. Staging, lighting, orchestra and cast rehearsals are fusing into what the company hopes will be a seamless whole; dress rehearsals begin Sunday and the Feb. 22 opener will be the first of six presentations of an opera that many people consider Britten’s finest work, although it isn’t as well known as Peter Grimes. This morning some media members and other guests got a backstage glimpse of the set for the production, which was created by a then-young New York City native named Francesca Zambello. Gary Murphy, LAO’s director of public relations wittily termed the morning “Walking the Plank.” As always, the perspective from the stage is radically different from the seats, although the morning began in the Founders Circle so that we could get front-facing perspective of a set that was still coming together. This production debuted in Switzerland’s Grand Théâtre de Genève in 1994 and opened the next year at London’s Royal Opera House, Covent Garden. It played in Los Angeles in 2000 and has become, says Rupert Hemmings, LAO’s senior director of production, “THE iconic production of this opera.” Plácido Domingo, LAO’s general director, believes this is the Zambello’s best work. In fact, it is so popular that there are two versions in existence, one based in London (which LAO is using) and the other housed in Paris. Despite the fact that the opera is set entirely on a British man-of-warship in 1797, the HMS Indomitable, Zambello specified to set and costume designer Alison Chitty that the production couldn’t include a ship and the sailors couldn’t wear military uniforms. Instead, Chitty created a raked, triangular wooden plank that stretches the width of the Pavilion stage and comes to a point looming over the orchestra pit to symbolize the ship’s deck (rigging and other paraphernalia in the background add verisimilitude to the effect). The front 2/3 of the plank tilts up sharply to reveal the cabin below where much of the second act takes place; from the seats, the effect resembles a geometric “Jaws-like” shark. Several of us “rode the plank” as it tilted up and down; others climbed warily down the ultra-steep stairs from the deck to the cabin (with my bad foot, I elected not to risk my neck on that trip — the all-male cast that numbers about 25 clearly has to be in great shape to maneuver on this set; no “Falstaffs” here). For L.A. Opera Music Director James Conlon, who is conducting Billy Budd for the first time, this production continues a life-long love affair with Britten. “When I was growing up,” Conlon wrote in an Opera News article, “Benjamin Britten was a contemporary composer.” As a high school student, he heard Britten and his partner, Peter Pears, perform two recitals in New York City. Written in 1951 and revised nine years later, the opera uses a libretto by E.M. Forster (who write A Passage to India and A Room With a View, among other works) and Eric Crozier from a novella by Herman Melville. “It is the second of three operas, along with Peter Grimes and Death in Venice, that play out in or around the powerful influence of the sea,” notes Conlon. “It is [also] the biggest of his large-scale works.” The orchestra (the largest Britten used in an opera) has more than 70 musicians, the L.A. Opera Chorus numbers 46 and there are 10 boys from the Los Angeles Children’s Chorus. Altogether, counting stagehands and lighting folks, more than 200 people will be involved in this production (“not counting ushers and ticket takers,” says Hemmings with a wry smile). In the title role, Bonner (right) — a 32-year-old Pittsburgh native — steps into the shoes of Southern California native Rod Gilfry who created the part in the London production and played it here 14 years ago. Although new to this role, Bonner has an extensive background in Britten’s music; he played the role of Sid in LAO’s production of Britten’s Albert Herring in 2012. One of the critical elements to the role is that Billy stutters; in fact, the opera’s tragedy revolves around this impediment. “What makes that particularly difficult,” says Bonner, “is that Britten writes the stuttering into the music and no two times are the same. You really have to stay on your toes.” Especially when walking the plank. • The opera runs about three hours with one intermission. It is sung in English with English supertitles (it will be interesting to see how much those are necessary). • Conlon will deliver a pre-performance lecture an hour before each performance. • The are several excellent articles in the “Learn More” tab of the LAO Web site. • The sets nearly didn’t make to L.A. in time. Bad weather in London and then New York pushed things to nearly the breaking point.